Heat. No rain. Tornadoes. Yep, Tornadoes. 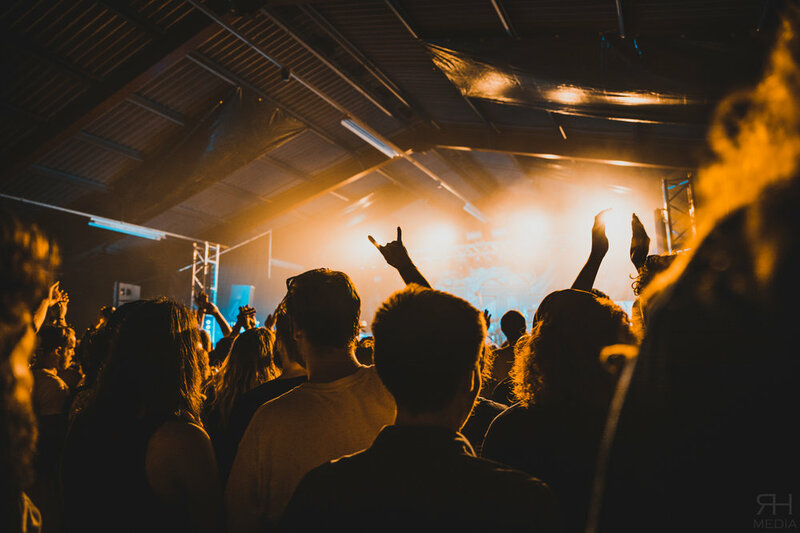 These are just a few things that are a rarity at UK festivals alas UK Tech Metal Fest 2018 had it all. The four day sweat-fest featured sunburn, a secret band and as many cries of “Whooo” as you could possibly tolerate. Into its sixth year, UKTF opened Newark Showground only two hours before the first band went on stage – just enough time to get the tent up and crack a (no-longer) cold one. Midday sun made the first day of UKTF hard work for everyone, bands, crew and punters alike. It also whipped up the wind to such an extent that loose airbeds or cardboard flew around in small tornadoes, dubbing UKTF 2018 as UK Tornado Fest. Jonny Turner started the Waghorn Stage with a small audience; it seemed that the weather kept people under their gazebos and in their paddling pools this early in the day. Accompanied by Youtuber and vocalist Christina Rotondo, the opening set of the festival was well received. It appeared that 2018 was the first UKTF for many, and that many people thought that bands only started at 13h00. From here on out, the turnout was far greater. Embodiment, Taken By The Tide and Ursus were greeted by larger crowds but the greatest audience interaction must have been from Siamese who provided a mashup of pop covers much to the delight of some and the dismay of others. Ravenface pulled a decent sized crowd which are by this point suitably warmed up (weather not withstanding). After this, the Winspear Stage was opened. 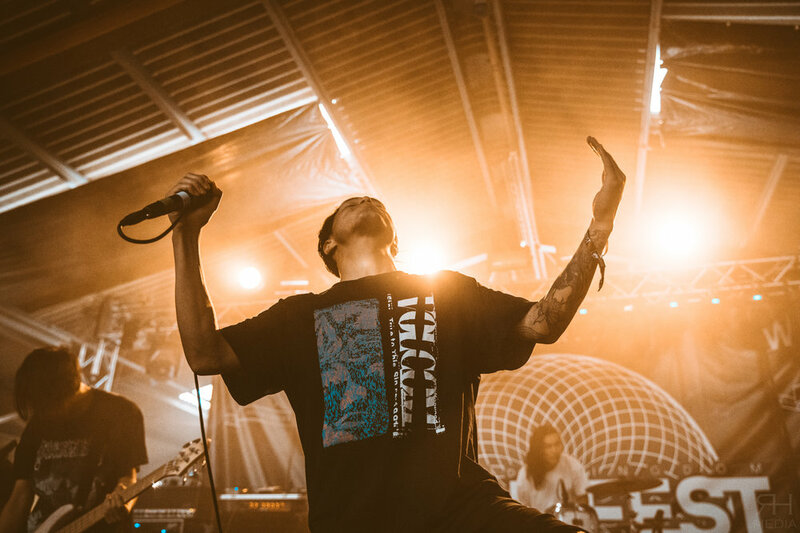 Crystal Lake were among some people’s highlights of the weekend – the band produce an energy that is never-ending - their entire set moves without a pause for breath. The only respite is during the changeover for Heart Of A Coward. The tech metal veterans had endured a lengthy quiet period of late but following the announcement of Kaan Tasan as their new vocalist earlier in the year, they’re ramping things up again. With a good mix of material both new and old, HOAC headline the Winspear Stage honourably – new single “Collapse” gets a similar response to older track “Severance”; “Deadweight” also has the audience opening up the pits and vying for the mic. After being forced out of your tent at 08h00, it’s time for a breakfast Shmoos and a breakfast bev. Lots of people retire to Smoky Tentacles for the shade and shisha before the stages open again at 12h00. Following the visa-based cancellation of Ukranian band Jinjer, the set times on the Friday of UKTF change around a bit, small local band Altitudes open the Waghorn Stage and You Win Again Gravity open Winspear Stage. The day goes on like this back and forth between stages with From Eden To Exile, guitar virtuoso Chris Schiermann and Glaswegian deathcore four-piece From Sorrow To Serenity. Vola, Bleed From Within, Voyager and The Contortionist set the scene for the headliners and Tech/Prog kings: SikTh. 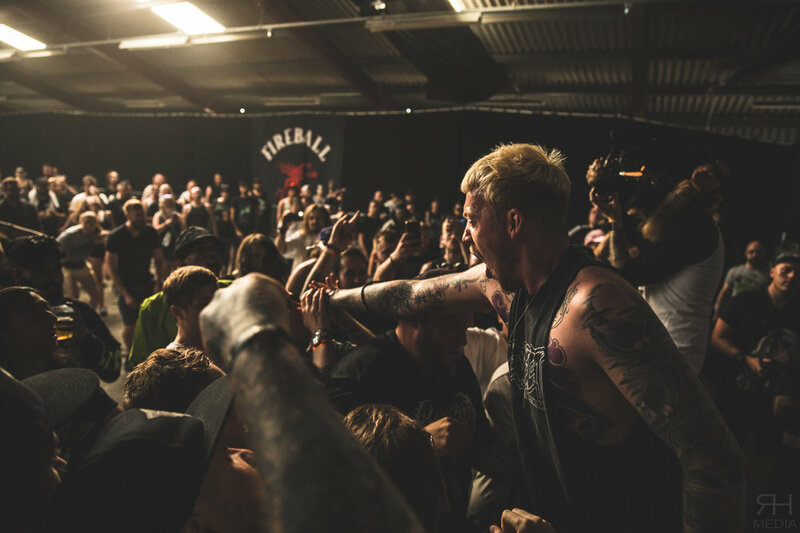 Necks snap back and forth, moshes ensue and the group play out a stellar second day. By Saturday, most people have arrived, the feeling is good and the weather is STILL hot. With not a cloud to be seen, it’s verging on unpalatable. Today we catch prog wizards Arch Echo and Martyr Defiled’s last ever UKTF appearance. INGESTED bring the heavy to the Winspear Stage where The Acacia Strain firmly keep it there. Water sprays from the stage, both straight from the bottle and from vocalist Vincent’s mouth. Nice. Sunday brings the entire festival to a head, opening with guitar craziness from The Surrealist and sludge/thrash behemoths Conjurer. Lotus Eater epitomise tech metal with their set of mic grabs, disgusting breakdowns, and huge clean chorus vocal hooks. Loathe have played UKTF before, but that was before their debut album The Cold Sun which saw them rocket to the top of the scene. With easily crowd worthy of a headliner, Loathe brought their trademark performance to the Winspear Stage. Playing material from all three of their previous releases, Loathe stick firmly as one of our highlights for the weekend. 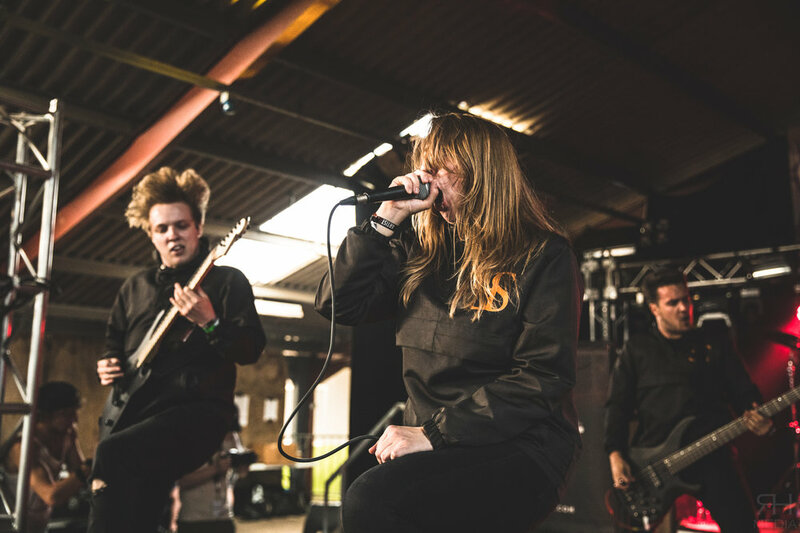 Over on the Waghorn Stage, Employed To Serve get aggressive – shouting over to their fans and jumping around with wild abandon, the coordinated 5-piece keep spirits high before the mysterious secret act. 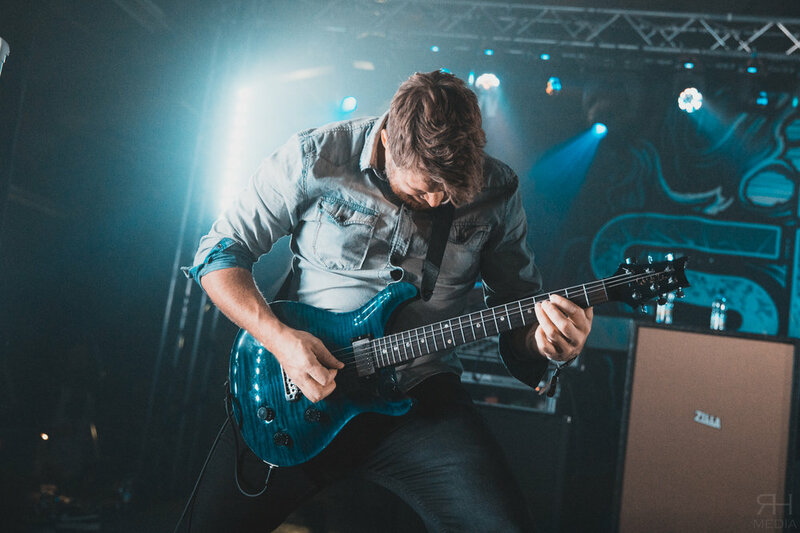 Since Protest The Hero and Norma Jean pulled out of the festival some months ago, the headliner slots had been up in the air a little – so when it was announced that a *SECRET ACT* would be playing on the Sunday, speculation abounded. 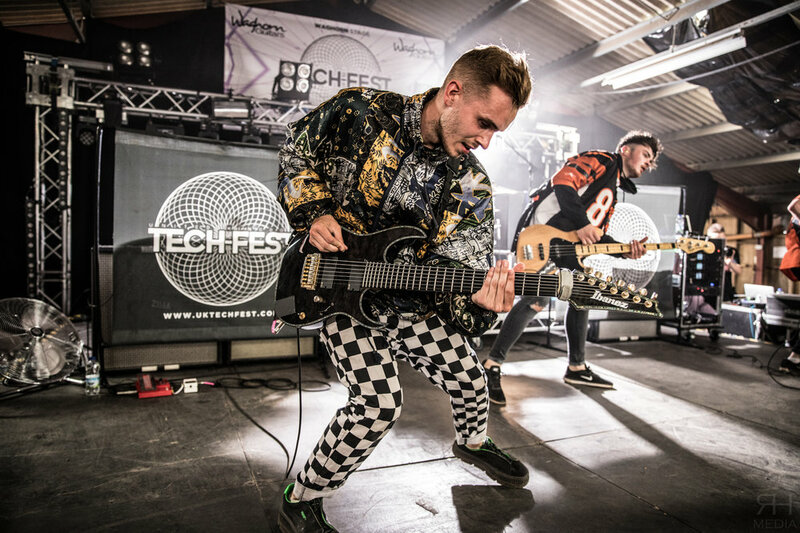 Some people thought it may a play on words, or an anagram that would see TesseracT grace the main stage – others joked it would be local hero and regular Harrison playing the ukulele for 90 minutes. Neither turned out to be true – in the end, it was Sleep Token. The Winspear Stage was full at this point, though from the demeanour of those in the crowd, you’d have never thought it – for a Tech Metal festival, the last things you expect a crowd to be are calm, serene and utterly captivated. Sleep Token brought this out in their audience with a seven track set that entranced all those in attendance; some proceeded to yell “Worship” and “Praise Him”.The secretive group were kept under wraps before their set and were whisked away promptly after its conclusion, leaving the crowd to fetch a final drink before the final act of the weekend. 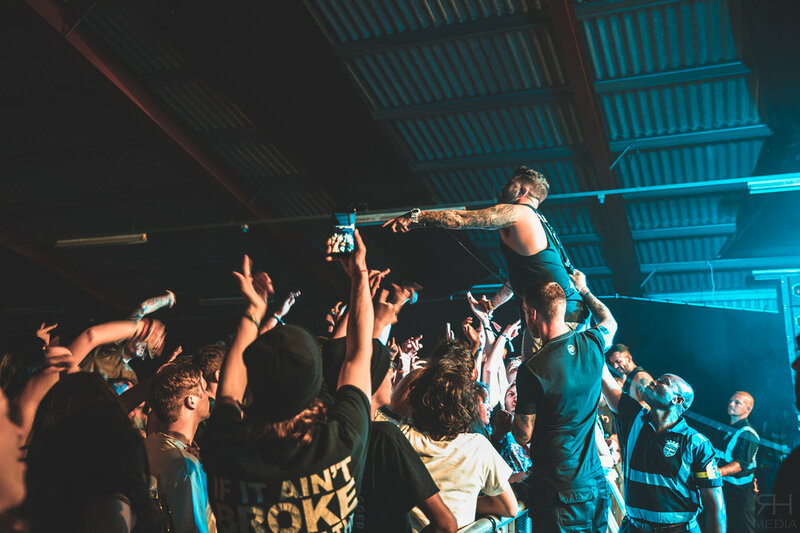 Betraying The Martyrs soaked up the last energies of the masses with a headline set that had people dancing as well as moshing. The weekend on the main stages was over, only the afterparties remained – which saw VNDTA, the Linkin Park Tribute set and tech-eoke into the early hours of the morning.